I am happy to announce that after nearly a year of waiting, my first Seeing Eye puppy is on her way! 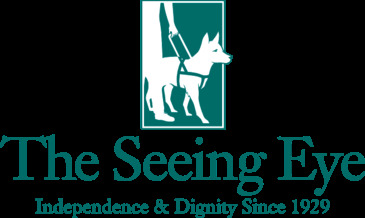 For those of you who don't know me, I am a raiser for the Seeing Eye Inc. of Morristown, NJ, the oldest guide dog school in the United States. This year, TSE is celebrating their 70th year of puppy raising. Puppies are assigned to families and individuals, whom they live with for anywhere from a year to 16 months. As a raiser, I will be training the puppy in obedience, house manners, and general desensitization to various locations and circumstances. On Valentines Day, I know that I will be receiving a female Black Lab, who will be joining my five-year-old Chocolate Lab, Dakota, however, I do not know her name. The Seeing Eye names all of their puppies by assigning a letter to each litter in order of birth from A-Z. This makes it easy to recognize siblings and in fact, my puppy's sibling will belong to another member of my school club. What I do know is that she is from the "P" litter, meaning her name will start with a P.
And this is where you all come in! From now until 12:01 EST on February 14th, take a guess through the entry in the Rafflecopter widget below as to what "P" name you think she'll have! However, I will pick seven random names, regardless of your guess, from the widget and each person will receive a mini CG Ruby Pumps and a mini Out the Door Top Coat. So even if you aren't correct, you still have a chance to win! Good luck and get to guessing! Princess Polish, Princess Puppy, and Little Miss "P"
What a great job! How do you become a raiser? Do you go through special training? where do we put the name?? Thanks for a great giveaway! good luck with the new dog. I think it's great you're doing this! Yay for puppies and giveaways! Congrats on the new baby, I love the smell of puppy breath! It's a great thing that you are doing with the puppy. I know someone will be happy to get her. that wonderful about the puppy i would love to do something like that! thanks for this giveaway! Maybe her name will be Princess? Congratulations on the new addition and thanks for the giveaway. So amazing that you're raising a Seeing Eye Dog! Thank you for being so selfless! And thanks for the giveaway too! XOXO! Found your blog through zoya's facebook. Love it already! Such a wonderful thing to do! Love the giveaway too! Great giveaway! Congrats on Puppy "P"! They're adorable, aren't they? Although, they are the craziest of the three color labs! I said Penelope after a character on Criminal Minds. I already filled out the form. I look forward to seeing pictures of the puppy. Awww! I hope you love your doggie! and thanks 4 the giveaway! best of luck with your new companion! i'm hoping my disabled vet husband will eventually get a service dog. cheers! Great giveaway. Good luck with the pup! Congrats and thanks for doing this! I'm guessing the name is Penny! I NEED pictures!! !